Class Act is a pioneering BBC training programme which aims to shine a light on experienced disabled actors already working in the industry, as well as discover and develop the potential of up-and-coming talent. The development programme comes as part of our ambition to support and raise the profile of disabled actors. The BBC has set challenging 2020 disability targets (8% of all staff, leadership and on screen) which go further than ever before and aim to ensure our content reflects the public we serve. Actors were asked to provide a self-taped audition and 32 actors were selected to take part in an intensive three-day skills training programme working with industry professionals to develop skills for auditions and camera technique, acting and business skills, script and character work. 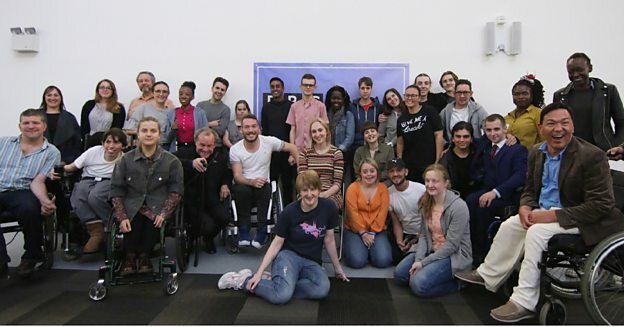 Each actor also worked with a director from the BBC on a two minute scene and met with representatives from across BBC Content’s Commissioning teams and The Writersroom, providing support and encouragement to the actors and reinforcing the BBC’s commitment to improving disability portrayal. The Class Act Actors Directory shines a spotlight on all 32 actors and we encourage the use of it as an ongoing resource. There’s some great talent here and we hope the actors will be considered for roles across all productions, not just where disability is theme. On-screen portrayal of disability is increasing with more disabled performers represented across the BBC’s programmes, and we want to encourage more. The Class Act training was run by ThinkBigger. Read more about the Class Act participants on the BBC Media Centre website.